Get more leads by setting up your on-site audit widget. Get leads and offer value at the same time by activating the site audit widget! 1. Download the SEOReseller Partner Plugin and install it on your WordPress website. Go to your dashboard and download the SEOReseller Partner Plugin. You will need to access your WordPress admin to install the plugin. Follow the installation instructions here. 2. Go to Setup Audit Widget. In this section, you can set up your on-site audit widget and customize its appearance. Write the Form Name and choose the Form Type. You can choose more than one Form Type and set it to appear on all pages or on specific pages of your website. If you want to make it appear across all the pages, tick Install to All Pages. Note: The Install to All Pages will only be activated for one Form Type. You can customize the copy, colors of the form, and the button to fit your brand. For the Takeover Form, you can change the takeover type (time delay or on scroll) and the delay period. Click Generate Short Code once you're done customizing the widget. If you've ticked Install to All Pages, the short code will be integrated on your site automatically. The short codes for the audit forms you've created is available at the bottom. All you need to do is copy these codes and paste them on the pages that you want the widget to appear. And you're all set! 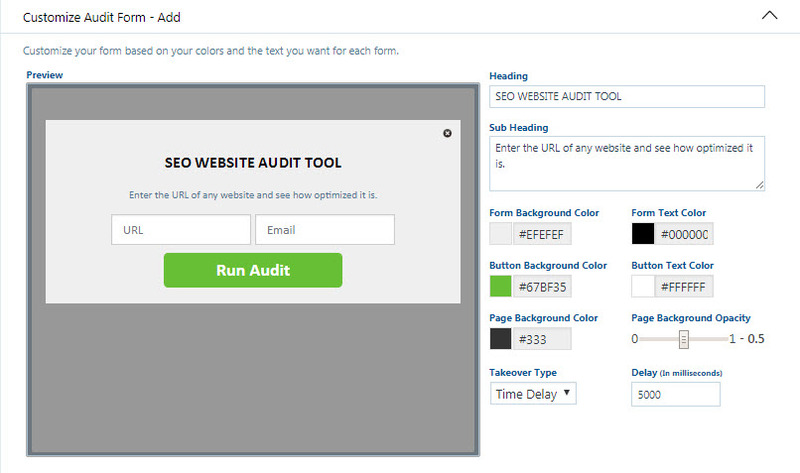 Your On-site Audit Widget is now activated and ready, so your agency can start getting leads!